On his recent visit to Cairo, Hoopoe sat down with translator Jonathan Smolin to ask about how he first fell in love with Moroccan Noir and his rendering into English of two contemporary Arabic novels. 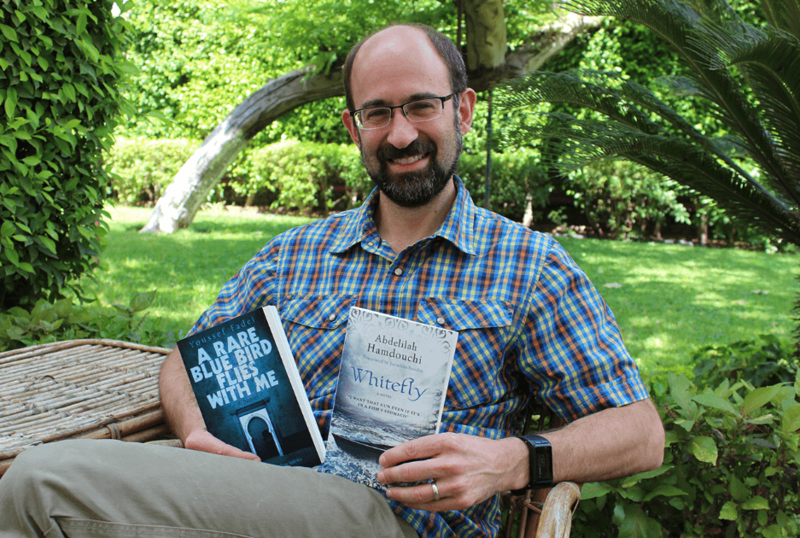 Jonathan Smolin, you are the translator of two Hoopoe novels: Abdelillah Hamdouchi’s Whitefly and Youssef Fadel’s A Rare Blue Bird Flies with Me. What intrigued you about these two stories from the Middle East? I first discovered Abdelilah Hamdouchi’s Whitefly when I was living in Fez, Morocco, in 2001. 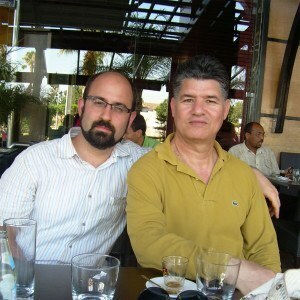 At the time, I was going to the bookstores nearly every day and learning everything I could about Moroccan literature. I was shocked when I found Hamdouchi’s police novels—at that point, they were the only police novels written in Arabic anywhere in the Middle East or North Africa. This led me on my own kind of investigation. What was happening in Morocco at that time that created the emergence of an Arabic police novel? How did the novel connect with changing conceptions of human rights and freedom of expression? Why were the police, until the late 1990s symbols of torture and abuse in Morocco, suddenly the subjects of such entertaining narratives? Whitefly was one of the first steps for me in exploring these questions. My own investigation into the subject ultimately led me to write my book Moroccan Noir, which traces the important links between politics and police entertainment in the country’s mass media. As for A Rare Blue Bird Flies with Me, I fell in love with the novel when I taught it in my Advanced Arabic class at Dartmouth College in fall 2015. Starting in the late 1990s, former political prisoners in Morocco published dozens of memoirs about their experiences of political imprisonment, torture, and abuse during the 1970s and 80s. In his novel, Youssef Fadel wove these various real-life memoirs into a single fictional narrative that represents the collective consciousness of the country during these years. It’s a brilliant work and Fadel deserves all of the critical acclaim that he has received for it. During most summers, I direct a study-abroad program for Dartmouth College in Rabat where I also teach a seminar in English entitled “Modern Morocco.” This seminar explores key themes in contemporary Moroccan society, such as human rights, freedom of expression, pluralism, and identity. I realized that I needed to be able to teach Hamdouchi’s and Fadel’s novels for this course to be a success so I decided to translate them myself. I’m honored to know both Hamdouchi and Fadel personally and we’re extremely fortunate that they and other writers come to speak with the students in my seminar about their work. Hamdouchi and Fadel are both very different writers: how difficult was it to transpose into English the flow, the mood, and the tone of their respective narratives? The Arabic of both texts is deceptively simple but each represented different challenges. An important issue in translating Whitefly was to think about the genre of the police procedural in English. What are the conventions of sentence structure? Of dialogue? Of narrative flow? I read many police procedurals originally written in English in order to understand the genre as it exists in the US and I did my best to make the text flow as well as possible in translation while still respecting the Arabic. Fadel’s novel presented entirely different challenges. Much of his writting, in A Rare Blue Bird Flies with Me and in his other novels, flows like waves. His narrative is much closer to spoken speech with its flows, iterations, diversions, and circulations. Fadel’s language moves beautifully and I only hope that the English text reflects that. Why did you add a foreword in A Rare Blue Bird Flies with Me and not in Whitefly? How much political and cultural context does a reader need? I’ve already published widely on the Arabic police novel so I didn’t feel that a foreword was necessary for Whitefly. If readers are interested in the genre, I’d encourage them to start by looking at my book, Moroccan Noir, published in 2013 by Indiana University Press. What other works or novels have you translated? I’ve also translated another police novel by Abdelilah Hamdouchi entitled The Final Bet, which will be reissued by Hoopoe this fall. The novel was published a year after Whitefly. Instead of a case of international sabotage, The Final Bet explores the problems connected to what is called “preliminary detention” in Morocco. That’s when the police can detain a suspect in a crime for 48-72 hours without allowing the suspect to contact a lawyer. Hamdouchi puts his finger on the possibilities of abuse in this system but wraps it in an entertaining crime story. I think it’s a must read for anyone looking to understand modern Morocco.